The packaging for Crystal Rodimus is the same box design as the regular Hot Rodimus, but instead of full color, it is washed over in blue and white. Also, the “15th Anniversary” sticker which was stuck on to other Generation One packages is printed in white and blue instead right onto the packaging. The back of the packaging has definitely changed. The illustration featuring Metroplex and a battle scene is overlayed by the front and back of Crystal Rodimus’ tech specs. Also, Hot Rodimus’ “C” designation is changed from C-78 to C-78C (presumably for Crystal). Also, the lower section of the back does not have the regular Japanese writing but rather the 15th anniversary logo appears once again with (presumably) details about the toy. This review will cover the changes made to the toy. For a more detailed review of the toy itself, please read the Hot Rodimus toy review. In vehicle mode, Crystal Rodimus is almost all translucent colors. 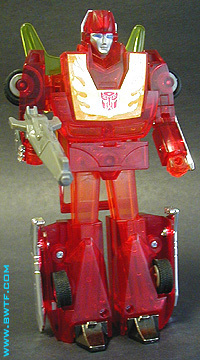 The main body of the vehicle is translucent red. His spoiler is translucent yellow. The four wheels are the rubber wheels used in the regular Hot Rodimus toy. The engine and the exhaust pipes running along the sides are the same vacuume metallized silver as the regular Hot Rodimus release. The two stickers visible in this mode are the Cybertron/Autobot “rub symbol” and the flame pattern on the hood. Unlike most toys of the era of Beast Wars and beyond, Black Rodimus cannot stash his weapons somewhere in his vehicle mode (yes he can, in the hole on top of the engine! Although it can only hold one gun at a time - Goktimus), so be sure you have both the guns available to you. Begin the transformation by pulling back the rear of the vehicle and flipping out the robot feet. Swing out the forward sides of the car. Swing forward the hood of the car and turn around the waist section of the robot mode. Now flip down the engine on the hood to reveal the robot head. Lock it into place with the hood and then swing that entire piece down. Using the tab at the center of the hood, connect it to the waist area. Turn the lower arms of the robot forward. 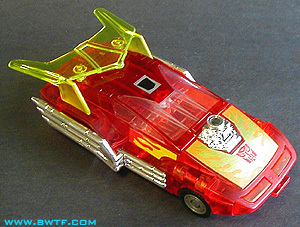 Rotate the section with the silver spoiler around so the yellow spoiler appears right behind Crystal Rodimus' shoulders. Place the guns into his hands and Crystal Rodimus is in robot mode. The robot mode carries over most of its colors from the vehicle mode, but it still looks fantastic. The fists and the upper legs are translucent orange. The robot head looks fantastic since the face is painted silver with blue eyes. This contrasts very well with the translucent parts of the robot head. The robot feet are the same die cast metal feet that the regular Hot Rodimus release has. The toy does come with the same stickers as the regular Hot Rodimus release, but I did not put them on. The two guns that come with the toy are their regular colors and not translucent. This toy review was written by Benson Yee.